Medical centers, doctor’s clinics, and hospitals constantly require medical release forms to hand over their patients to fill in and submit. 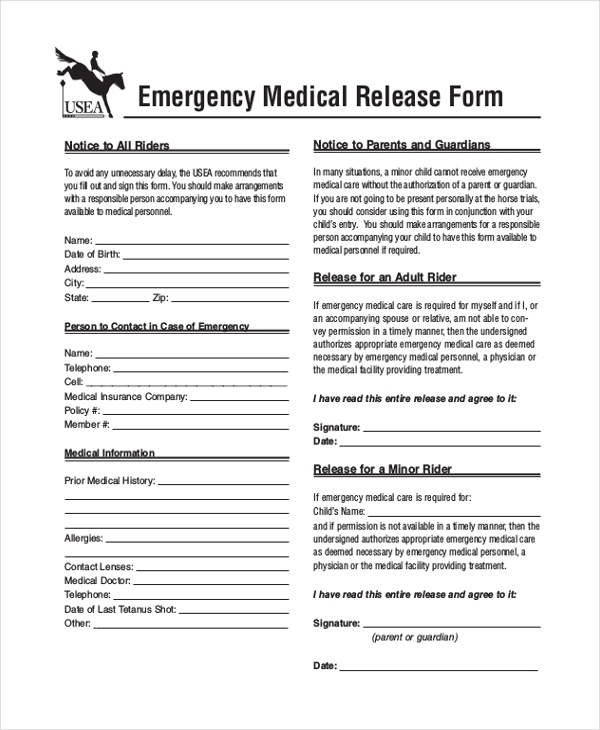 To make it easy for such medical institutions, we have a wide range of ready to use Release Forms. The forms are available in a wide range of formats to choose from and are also easily editable. These forms are professionally drafted and can be used by medical institutions of small, medium and large sizes. The medical records release form is a well-drafted template that allows the user to fill in details of the patient, details of the doctors, address of the health care center and other information. The release of medical information form is available in PDF format. It allows the user to add details of the medical information that has to be released, name of the patient, doctor and also has several other check boxes to tick. The authorization release form is another PDF format template. It has information of the treatment authorization for a student that the parent or guardian has permitted. It has space for the user to add the student details, information about allergies if any, date, the signature of the guardian and other details. The medical release form is a PDF format that is often used by fitness instructors, gyms, physical training coaches and various others. The form has space for the user to add details of the patient’s medication; intensity, duration and frequency of the physical activities and other details. 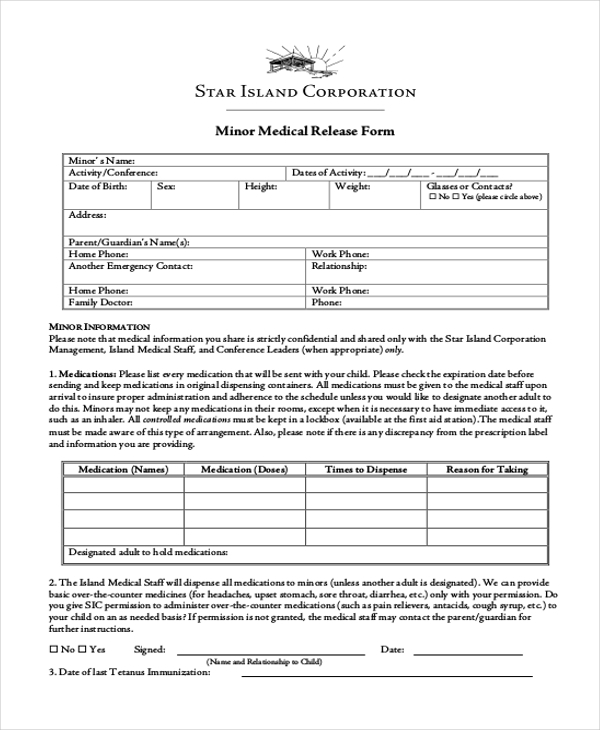 The minor medical release form is a PDF format template. It allows the user to fill in details of the medication names, doses, and time to dispense the medicine for the minor. The form has space for the guardian or parent to sign on it and give their consent to a designated adult. The medical release consent form is a PDF format template that is used by colleges and universities for their students. 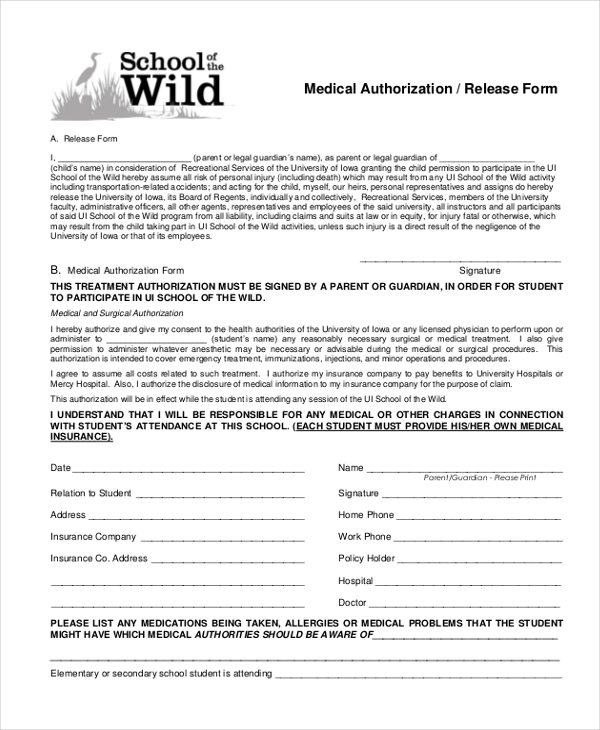 With this template, students can give their consent to the educational institution to send a release and send their medical information to a specific organization or individual. The emergency medical release form is ideal for riders participating in riding championships and training programs. Both minor, as well as adult riders, can use this PDF format emergency medical form. As the name suggests, students of universities and schools use the Medical Release Forms. This PDF form is typically suitable for students who are minors and require the consent of their guardians or parents for medical help. 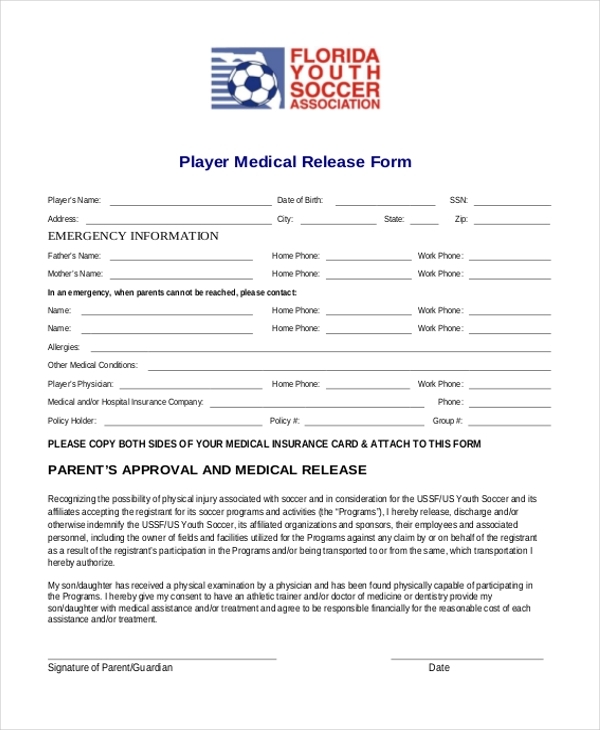 The player medical release form is for minor children who participate in soccer tournaments and soccer training programs. 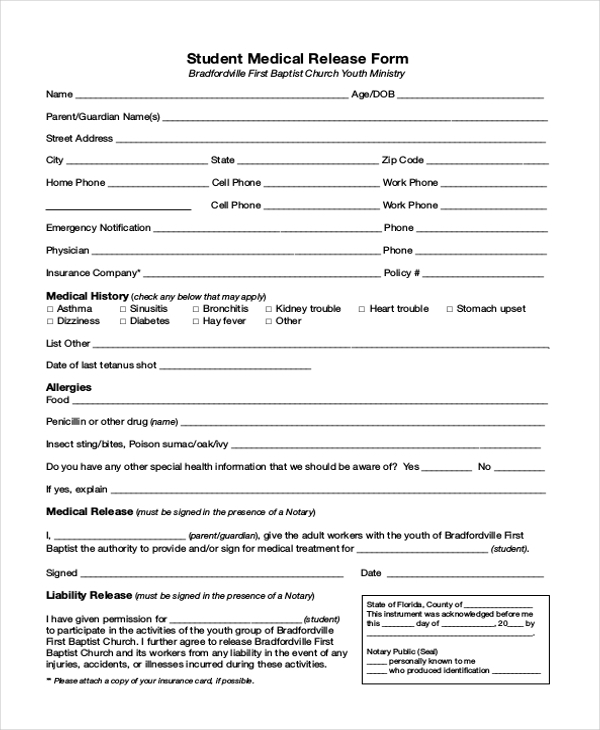 The PDF form is available in PDF format and has space for the guardians or the parents of the child to fill in his or her emergency information. 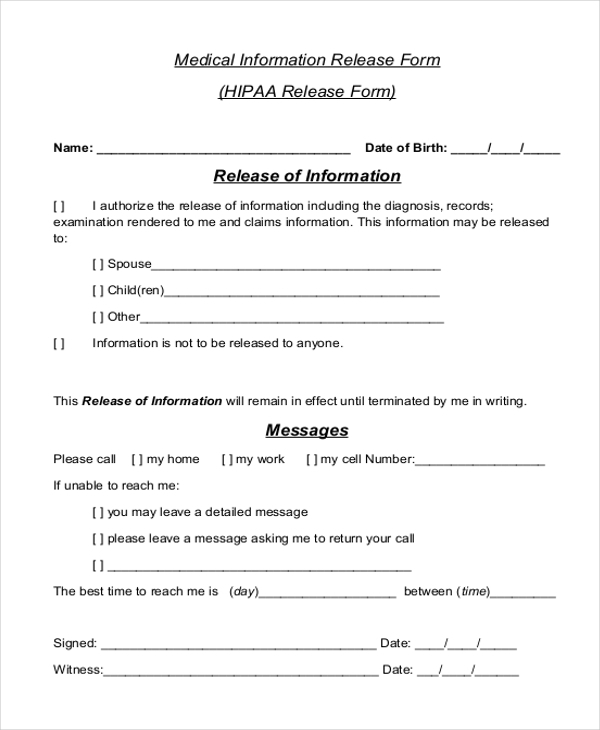 The HIPAA release form is another PDF format form. It is free of cost form and the user can add all his or her details to this form. It can be downloaded and emailed and is also printer friendly. 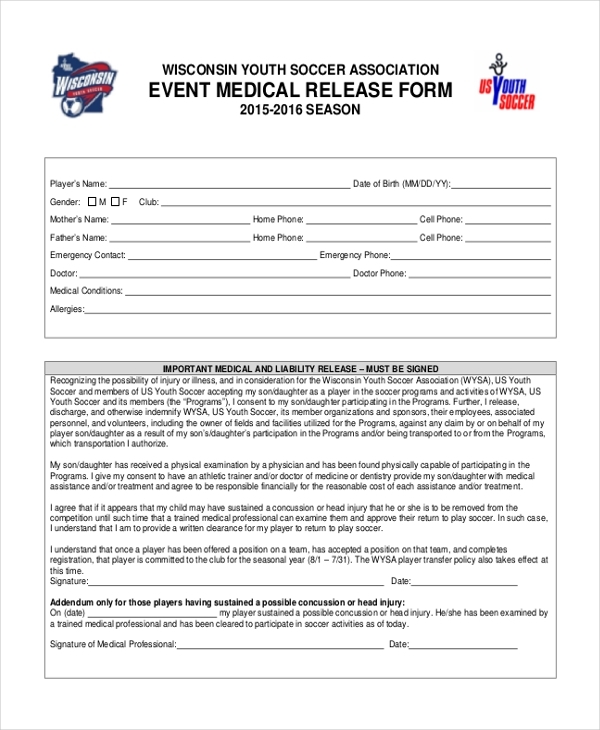 The event medical release form is for minors participating in sporting and other events. Parents or guardians can sign this ready to use form and hand it over to the association members organizing the event. 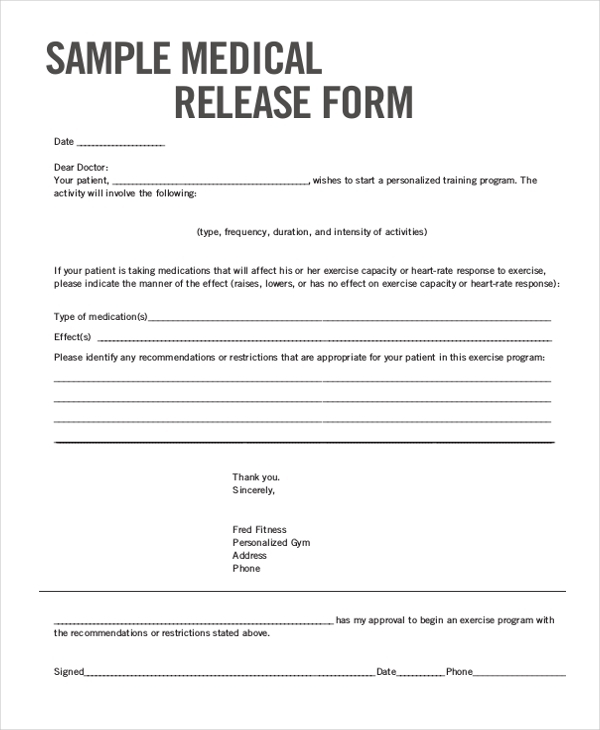 What are the Benefits of Using the Medical Release Forms? The medical release forms are ready to use and reduce the amount of time and money an organization spends on creating one from scratch. These forms are absolutely free of cost and the user doesn’t need to get a professional to draw up the medical release form for a heavy fee. The forms are also printer-friendly and can be emailed, thus making it easy for the user to access. Another reason that the forms are beneficial is because they are available in convenient formats like Word and PDF and they can also be edited as per the requirements of the user. You can also see Media Release Forms. What is the Target Audience For the Medical Release Forms? The medical release forms are handy for sports associations, schools, colleges and universities, horse riding associations, event management associations, physical training coaches, and various others. Corporates and business organizations may also require this form from time to time for their employees. For the most part, this form is used to acquire the signature of the guardian or parents of a minor that permits the acquirer to have access to the medical records of the child or provide medical assistance to the child as an when it may be required. 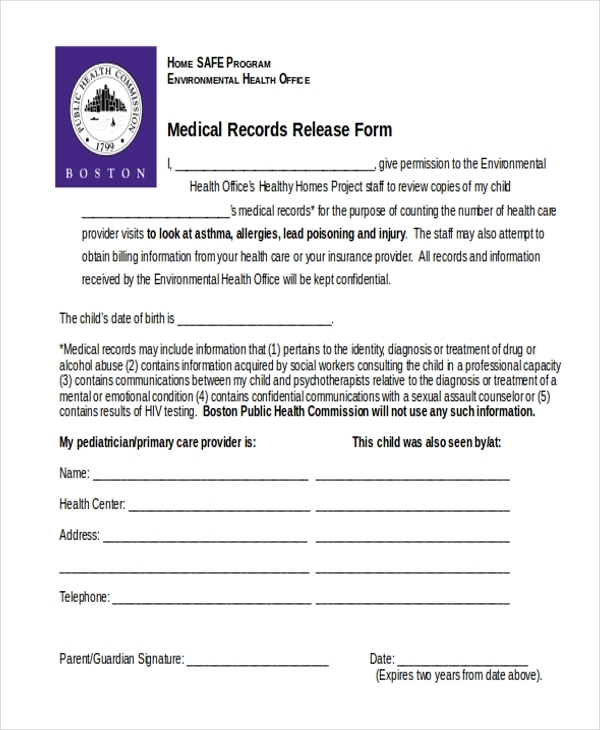 Hospitals, medical centers, and other health institutions also often use the medical release form. You may also see HIPAA Release Forms. So if you’re looking out for medical release forms for your organization, you have come to the right place. Our ready to use lien release forms are available for multiple purposes and are extremely handy and useful. All you need to do is select one that best suit your requirement, edit it, print it out and you’re good to go.